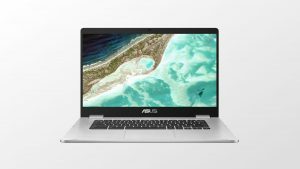 ASUS has crafted a pretty compelling package with one of the main standout features of the larger C523 is clearly the 15.6-inch display. As a matter of fact, this is the first time ASUS has ventured into the 15-inch territory, joining the company of Acer and Lenovo. I think these Chromebooks could become contenders as long as the price is reasonable. A listing on Adorama’s site shows what looks like the base model with a price of about $270 configured with an Intel Celeron N3350 (dual core), 4GB RAM and a 32GB SSD. The information for this post is based on an article by Robby Payne at CHROMEUNBOXED, follow this link for the complete article and more details. Here is some additional information from various sources: THE VERGE, NEW ATLAS, ASUS Website, and c/net.